Want to change the world? Let love be your energy. Let love be your energy. 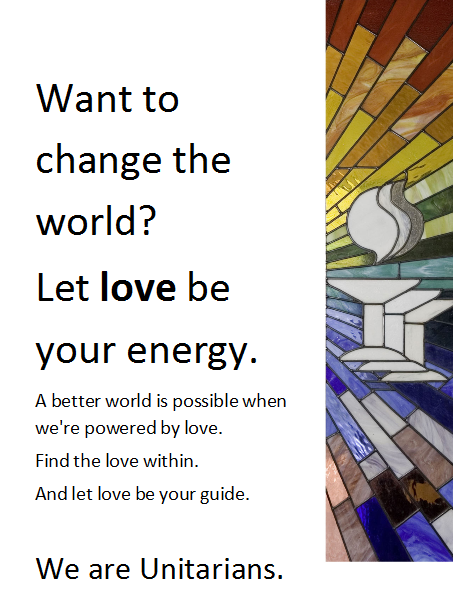 A better world is possible when we're powered by love. And let love be your guide. 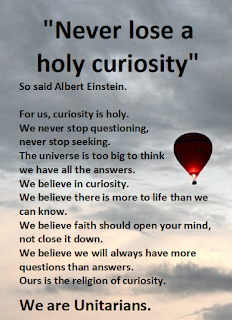 For us, curiosity is holy. We never stop questioning, never stop seeking. The universe is too big to think we have all the answers. We believe there is more to life than we can know. We believe faith should open your mind, not close it down. We believe we will always have more questions than answers. 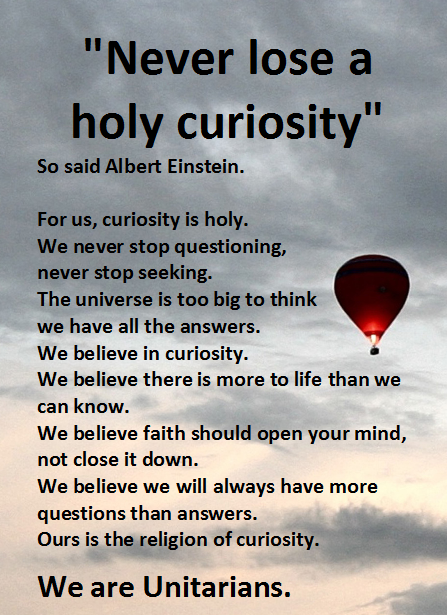 Ours is the religion of curiosity. We love Jesus. 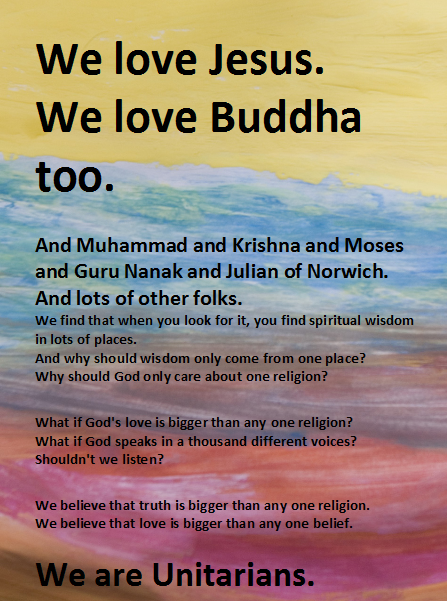 We love Buddha too. 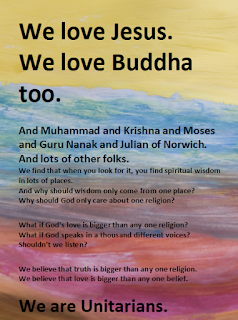 And Muhammad and Krishna and Moses and Guru Nanak and Julian of Norwich. And lots of other folks. We find that when you look for it, you find spiritual wisdom in lots of places. And why should wisdom only come from one place? Why should God only care about one religion? 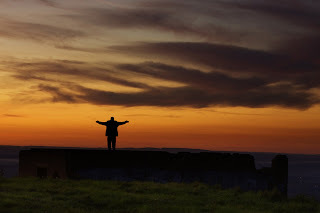 What if God's love is bigger than any one religion? What if God speaks in a thousand different voices? Shouldn't we listen? We believe truth is bigger than any one religion. 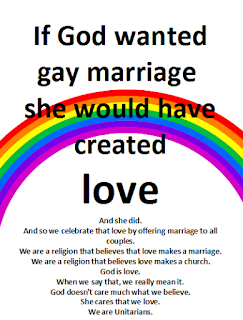 We believe love is bigger than any one belief. Wake up! 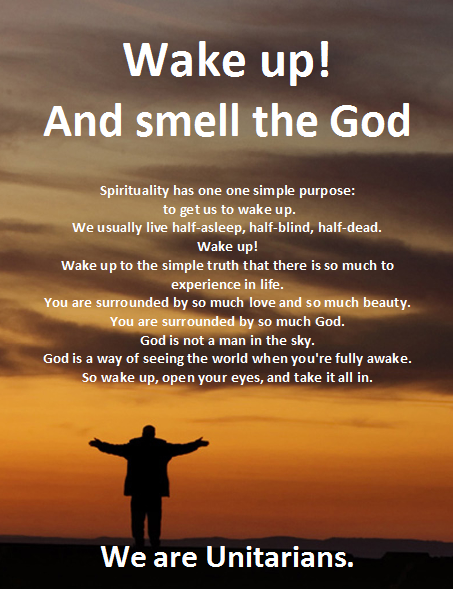 And smell the God. 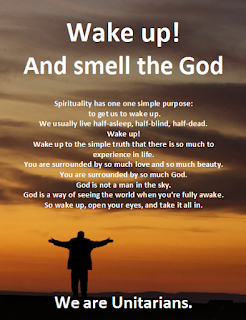 Spirituality has one simple purpose: to get us to wake up. We usually live half-asleep, half-blind, half-dead. Wake up! Wake up to the simple truth that there is so much to experience in life. You are surrounded by so much love and so much beauty. You are surrounded by so much God. God is not a man in the sky. God is a way of seeing the world when you're fully awake. So wake up, open your eyes, and take it all in. And so we celebrate that love by offering marriages to all couples. 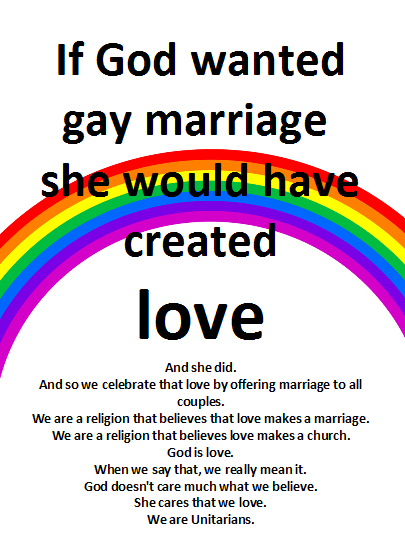 We are a religion that believes that love makes a marriage. 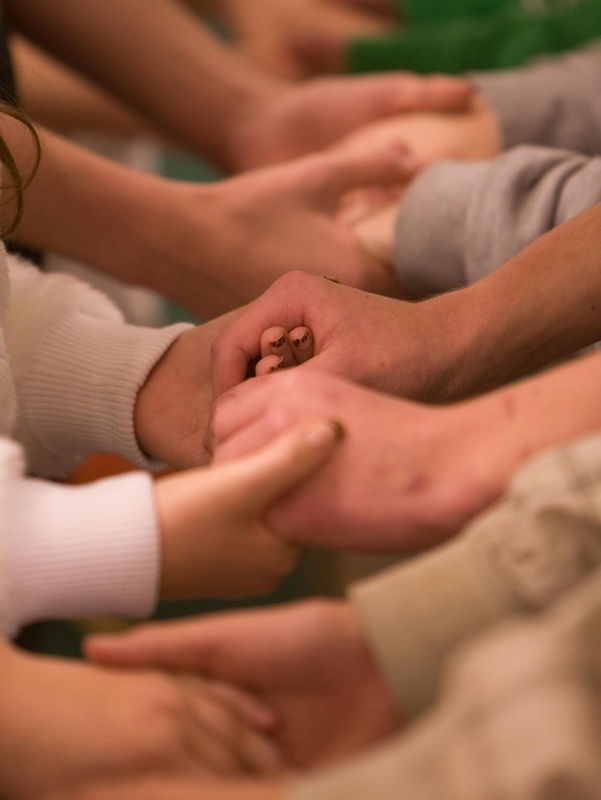 We are a religion that believes that love makes a church. When we say that, we really meant it. God doesn't care that much what we believe. She cares that we love. Jesus said love one another. Let's stick to that. 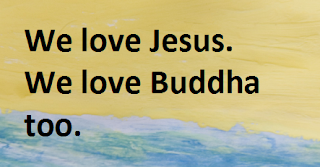 Jesus said love one another. 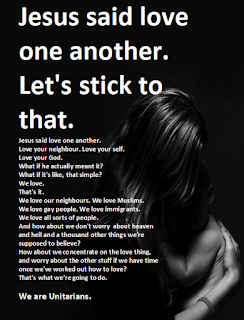 Love your neighbour. Love your self. Love your God. What if he actually meant it? What if it's like, that simple? We love. That's it. We love our neighbours. We love Muslims. We love gay people. We love atheists. We love immigrants. We love all sorts of people. And how about we don't make it any more complicated than that? 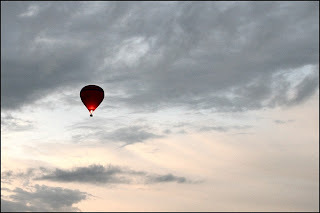 How about we forget about believing impossible things? How about we forget about heaven and hell and rising from the dead and a thousand other things we're supposed to believe? How about we just concentrate on LOVE, and maybe worry about those other things if we have time? 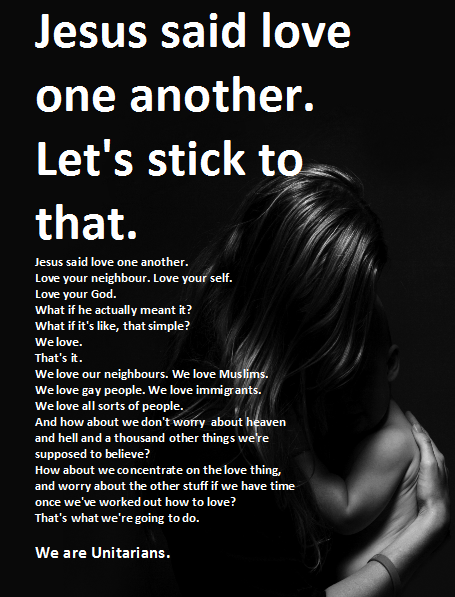 We have decided to stick to one commandment: love. And when we get that one right, we'll start worrying about other things. If you want a religion that cares more about love than doctrine, maybe you could join us. If you want a religion that is more interested in getting heaven into people than getting people into heaven maybe you could join us. 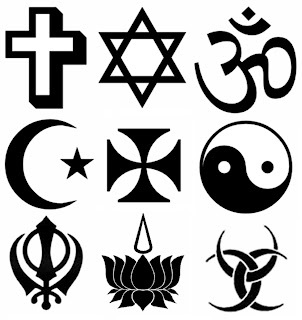 If you want a religion that keeps things simple, if you want a religion that's committed to the simple idea we should love one another, you're most welcome to join us. 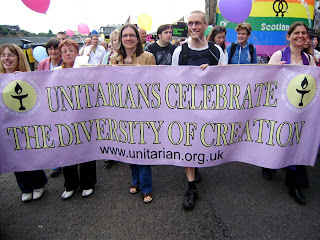 Will Unitarians disinvest in fossil fuels? I was pleasantly surprised last week when my Annual Meetings pack landed through my letter box and I discovered that there are no wordy social justice motions this year. Every year I hope and pray for that, but it's never happened before. Most years we have five wordy motions calling for this and that that we debate, pass and then promptly forget. It's an annual ritual that convinces us we're doing social justice when in fact we're just talking to ourselves. It's an easy social justice that doesn't actually require any work from us. But no, this year we don't have that. Thank God. Perhaps now we have an opportunity not to forget about what we did last year. Last year we passed a resolution calling for us to respond to combat climate change. Of course the resolution did not call us to any concrete action, but perhaps now we can walk towards that concrete action. One concrete thing we can do is disinvest Unitarian shares from fossil fuel companies. Climate change is the biggest issue we face. If the world is to stay below the 2C temperature rise then we need to move urgently to a low-carbon economy. If we are to stay below 2C then companies need to leave nearly all fossil fuels we know about in the ground. We cannot afford to burn them. And yet fossil fuel companies are basing their business plans on more extraction and more exploration for further sources of fuels. There is a growing movement to disinvest from such companies to demonstrate that these companies are having a negative impact on the world, and to refuse to profit from that impact. 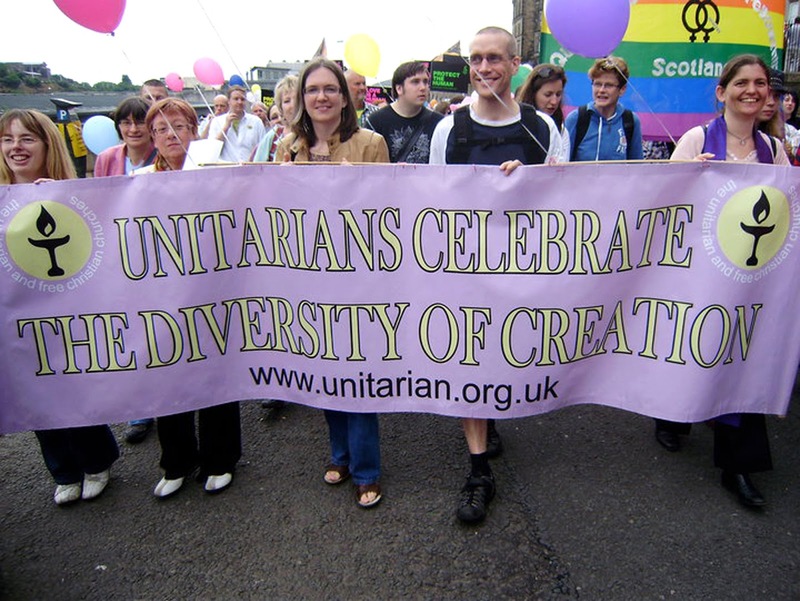 The Quakers and the United Reform Church in Scotland have already committed to this. And pressure is building for the Church of England to do the same. Now I have no idea what shares the Unitarian General Assembly has (who does?) but it seems to me this is something we should do as well. I know we're not as rich at the Church of England, but neither are we poor. There are considerable Unitarian investments. Are we prepared to use the power and wealth we do possess to actually do what we say we're about -building a better world? Are we actually prepared to do something concrete to move the world in the right direction? Can we walk the walk and not just talk the talk for once? Posted without comment to bookmark for future research and reflection.